Through many years of practice, I have mastered the techniques required to provide a stable piano tuning that lasts. Additionally, as a musician, I specialized in tuning by ear for thirty years. Upon discovering that modern computers are capable of duplicating what my ears can do, I began to use a computer in combination with my ears to provide my clients the best of both worlds. Contact me to schedule a piano tuning. Sometimes people go for many years without knowing that the quality of the tone of their piano can be improved. The piano may sound too bright or metallic when it could be much warmer. I have extensive experience working with the felt hammers that strike the strings to get the best sound possible out of a piano, making it much more enjoyable to play. Contact me to schedule a voicing for your piano. When a piano’s action is properly regulated, the touch is more even, and results in a more satisfying and enjoyable experience for the pianist. Regulation involves adjusting the action in the piano so that it plays properly. I can correct issues such as an action that is slow, making it difficult to quickly repeat notes, or an action that is heavy, causing it to be too hard to press the keys. To find out more information, or to schedule a regulation, contact me. I recommend that cleaning and detailing a piano be done professionally. I carry with me the tools to clean the inside of your piano while I am there to tune or service it. 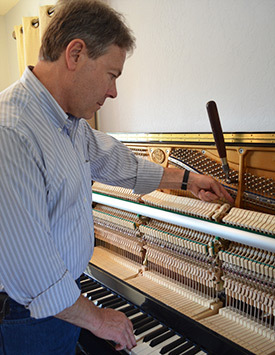 For pianos that require detailing, I have the necessary equipment, techniques, and experience to properly clean and improve the cosmetics of a piano, including touch-ups to the cabinet. Contact me for your piano cleaning and detailing needs. I am experienced with all aspects of repairs, such as broken strings, hammers, action parts, pedals mechanisms, and anything else that requires attention. I can put your piano back into good working order. Sometimes a high quality or sentimental piano can become worn out to the point where it requires rebuilding. I can advise you on the cost effectiveness of rebuilding a piano, and I can provide fine quality rebuilding services. For piano repair, or more information regarding rebuilding, contact me.